When I have played Morrowind in the past, I have to concede that I have always been seduced into starting the expansion content too early. To be fair, for Tribunal at least, it’s hard not to start it early if only to stop the assassins that regularly attack you while you’re sleeping. And for Bloodmoon, well, you can ask almost every single character in the entire game about Solstheim and be told you can get a boat there from Khuul. This time, however, I resolved to see much more of Vvardenfell than I had ever seen before, instead of immediately haring off to bash my head against content designed for characters ten levels above me. I joined all the guilds and began my ascent. I am drawn to matchmaking quests in RPGs like a moth to a flame. 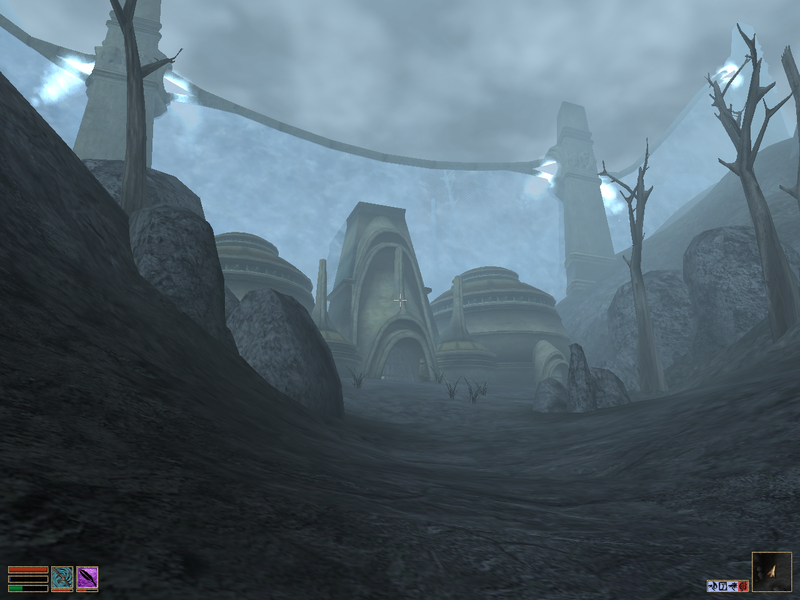 The guild structure of Morrowind contains some fascinating little edges whose loss has made subsequent games much less interesting. First up is the conflict between the Fighters’ Guild and the Thieves’ Guild — after not-very-many-levels the Fighters’ Guild are straight-up asking you to murder Thieves’ Guild members and take their things. While it’s possible to let Tongue-Toad escape rather than actually murdering him (as with most assassination-of-a-civilian quests), the mood of the Fighters’ Guild at this stage sets my teeth on edge. This is the game vanilla and unmodded, and it still has more beautiful and detailed skies than a game of this age has any right to. But while I mainline in fighting skills I always always always take a sideline in Security, because I loooove to rob tombs and evil shrines and anything else off the beaten track. Which leads me to the Thieves’ Guild, who generally only want me to steal from bad people — which makes a sharp contrast with the Fighters’ Guild who you’d expect to be the honourable ones. I pretty much always sideline magic because it is mechanically quite awkward. Switching between weapons and casting in a fight is sketchy and sometimes unresponsive so sticking to sword-and-board is my strategy. Even so, I like to bring in some Restoration because another vector for healing (and disease curing) is always useful in the wilderness, even if you’ve only got a tiny mana pool to cast it from. Turns out, though, the Mages’ Guild doesn’t consider Restoration one of their requisite skills, so that was a bit of a bummer. 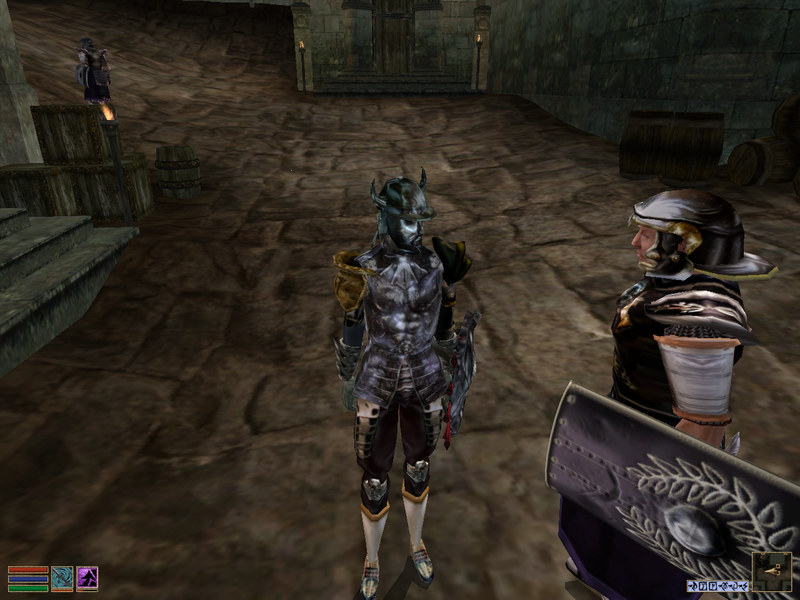 Ending up with a mad patchwork of armour pieces is one of my favourite elements of the game. When you’re young you can’t afford a matching suit, and when you’re old you’ve picked up loads of non-matching enchantments to wear. Yes, guilds have requisite skills. You can join anywhere with pitiful skills but they won’t advance your rank until you satisfy the requirements — so, for example, you cannot become Archmage without actually being a seriously competent mage (unlike in some sequels we can mention). For me in the Fighters’ Guild, that’s easy — I’ve been bashing creatures all day and night with a Longsword, taking hits on my Medium Armour and repairing it with Armourer, so my skills for the one guild I’m not sure about rising up in are top notch. The Thieves’ Guild is harder to climb because there aren’t as many locks to pick in the wild as there are creatures to bash and I’m always leery of actually going into normal people’s houses. The phattest lewt, after all, is in the Daedric shrines, not in simple townhouses. 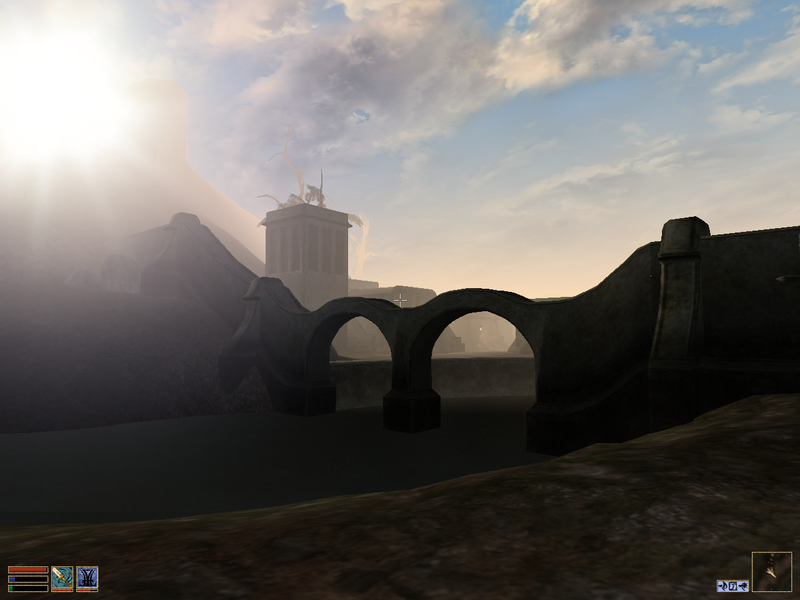 Seeing the grand architecture of Morrowind emerge from the fog gets me every time. The truly fantastic thing is that you don’t even have to feel bad about ignoring the main quest to do it. In a stroke of sheer narrative genius that seems to have been missed by every subsequent game, spymaster Caius Cosades literally tells you to go and do other stuff after some of his quests. “You need a cover story,” he says, “go and join a guild or something”. They made ignoring the main quest part of the main quest! The giant crab shell in Ald’ruhn is oroof that the Elder Scrolls world had proper kaiju in it at some point in its past. 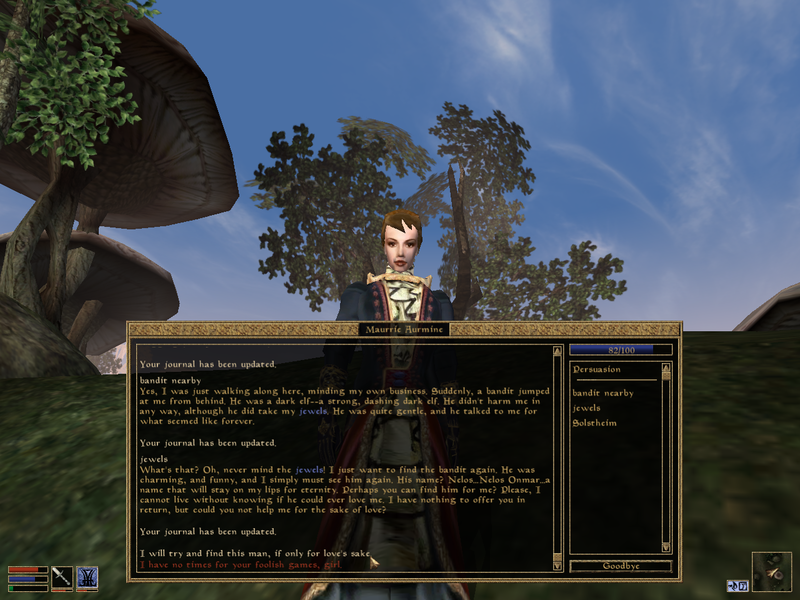 This is actually the first time I’ve managed to become head of any organisation in Morrowind. As I mentioned before, I usually get seduced by the high-level expansion content, and after that you’re pretty much ready to run naked into Red Mountain, punch Dagoth Ur off the ledge and win the game without taking a scratch. (Hint: it’s not a very well-balanced game.) This time, though, I’ve been taking it easy — reading all the books, pouring money into my non-levelling skills to create a genuinely rounded character, and I’ve taken over the Imperial Legion and the Mages’ Guild and the Thieves’ Guild is almost done. Guess I’ll be signing up to the Temple and the Imperial Cult next… and then I’ll have to pick a Great House to join… (and, yes, maybe somewhere along the way I’ll finally admit that I’m the Nerevarine and slap old Dagoth into the lava). 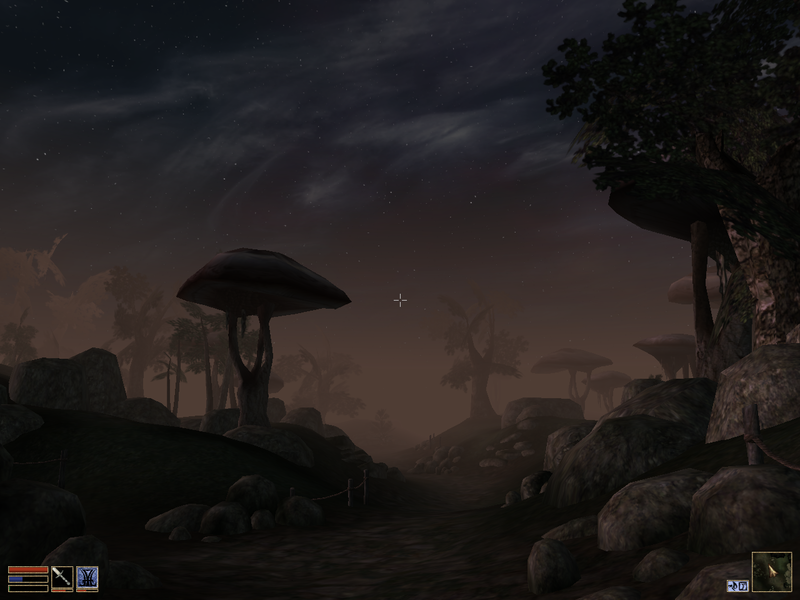 The haters can get tae, Morrowind IS a pretty game. 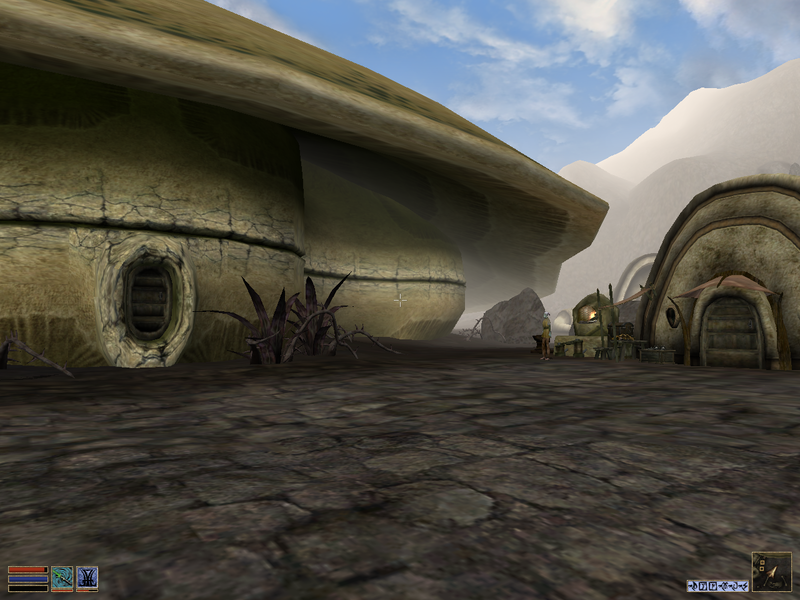 This entry was posted in Gaming and tagged Morrowind, The Elder Scrolls by Rao Dao Zao. Bookmark the permalink.